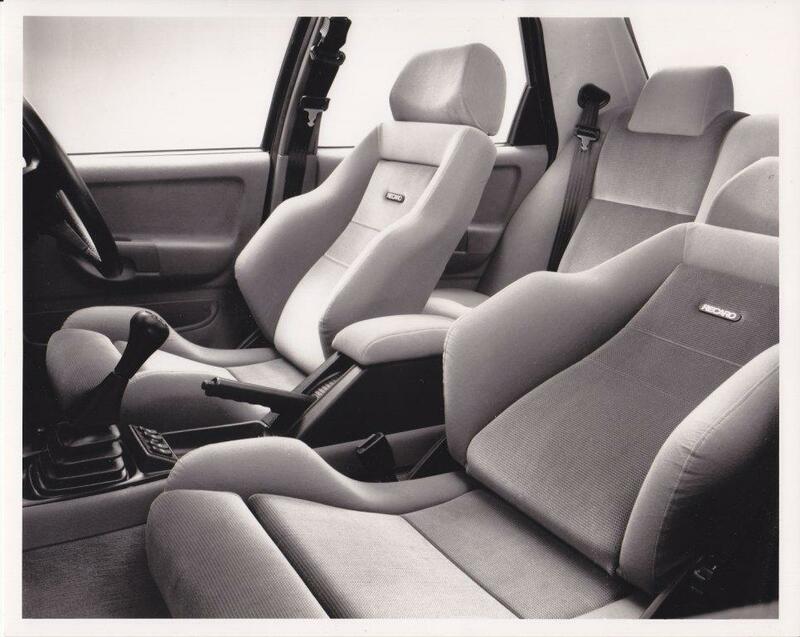 The Ford Sierra Sapphire RS Cosworth provides the best of both worlds by combining supercar performance with a very spacious and luxurious interior. Recaro seats, with height adjustment for the driver. 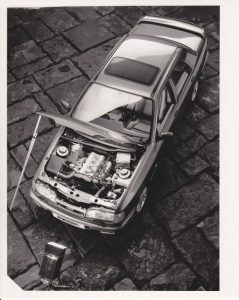 The 2.0-litre’s performance was produced by a compact Garret AiResearch T.03B turbocharger, driven by exhaust gases, and a very sophisticated electronic engine management system developed in association with Weber and Marelli. Among this extremely robust engine’s other features are connecting rods of forged heat-treated steel. Forged steel is also used for the five-bearing crankshaft. There are nine flywheel attachment bolts, instead of the standard car’s six, and a special heavy-duty clutch assembly. Following tests special spring-clamped brackets were devised for the inlet and exhaust manifolds. The result is a remarkably smooth, strong and responsive high-performance engine. Put through its paces by Ford engineers, the turbocharged 2.0-litre powered the Sierra Sapphire RS Cosworth to 60 mph from a standing start in an astonishing 6.1 seconds with a recorded top speed of 150 mph. The Garrett AiResearch T.03B turbocharger, driven by its exhaust gases that would otherwise by wasted, these boost the Ford-Cosworth engine’s power to 204 PS at 6000 rpm. This is not one of those high-performance engines that have to be ‘rowed along’ with the gearbox. 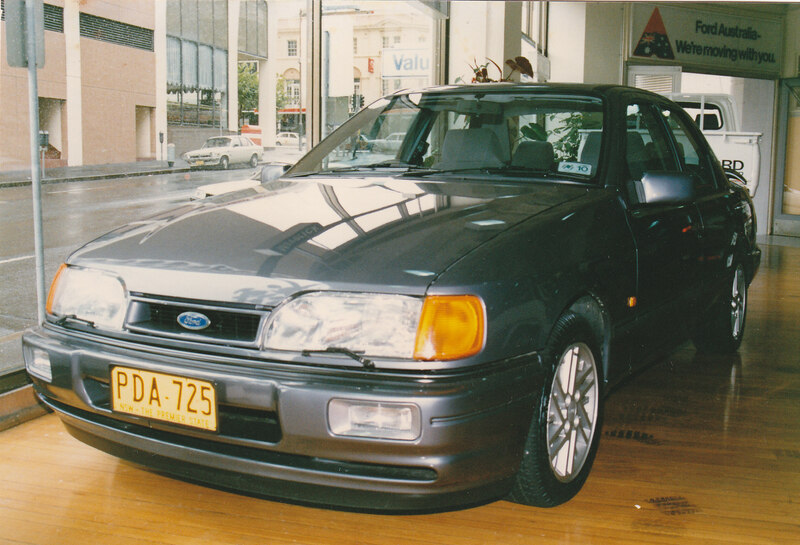 The turbocharger’s boost characteristics were set to generate very strong low-speed torque. In fact, no less than 80% of the engine’s maximum torque output is delivered at only 2300 rpm. High torque at low revs makes the car very flexible in slow-moving traffic and very responsive when the accelerator pedal goes down. Turbochargers produce a lot of heat, so the inlet charge’s temperature is lowered by an air-to-air intercooler. An oil cooler maintains efficient lubrication during sustained high-speed running. 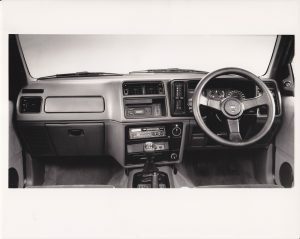 The management system developed in association with Weber and Marelli controls the engine’s multi-point electronic fuel injection, the electronic ignition, and the turbo’s boost pressure. The system is based on precise measurements of the air intake mass. Air pressure and temperature readings are supplied by sensors in the inlet manifold. The amount of fuel needed for efficient combustion is determined by relating information to data stored in the control unit’s computer. An incremental fuel cut-off prevents this spirited engine being driven too hard. Fuel supply is also cut off on the over-run, to improve economy and reduce exhaust emissions. Operating the turbocharger’s ‘wastegate’ safety valve was another of the management system’s functions. 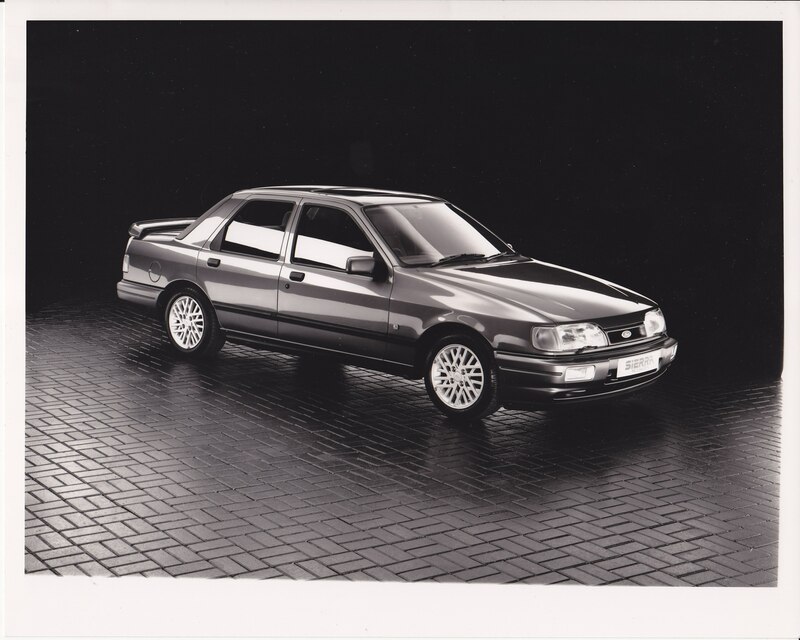 The Sierra Sapphire RS Cosworth was impressive on roads where driving enjoyment depends as much on road holding and handling as power and torque. 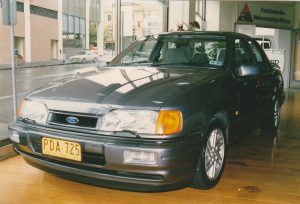 The Ford Sierra Sapphire Cosworth sporting character was additionally enhanced by a rear wing and lip- mounted onto the boot lid, which helped account for the car’s 0.33 drag co efficiency A smooth changing, close-ratio 5 speed gearbox ideally suited to the high- torque engine’s characteristics . It feeds power to a limited slip differential with a viscous coupling that automatically reduces the risk of wheel spin in slippery conditions without having any adverse effect on cornering in the dry.